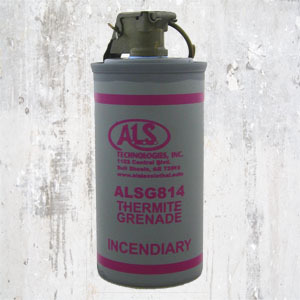 Description: Thermite grenades are used as incendiary devices to quickly destroy enemy equipment. Additionally, thermite grenades are used by friendly forces to destroy their own items and equipment when there is imminent danger of them being captured. When ignited, this formulation will burn through 5/16" of steel plate. Background: Thermite was discovered in 1893 and patented in 1895 by German Chemist Dr. Hans Golsschmidt. Consequently, the reaction is sometimes called the "Goldschmidt reaction" or "Goldschmidt process". Dr. Goldschmidt was originally interested in producing very pure metals by avoiding the use of carbon in smelting, but he soon realized the value in melting. The first commercial application was the welding of tram tracks in Essen, in 1899.